Read John's Gospel ... and soar on eagle's wings to new heights of spiritual wisdom. If you know of any other Catholic commentaries on John's Gospel that exist online, please let me know. St. John the Evangelist ... pray for us. Also see my previous post, "What Are the O Antiphons?". Also see my previous post, "What Are the O Antiphons?" 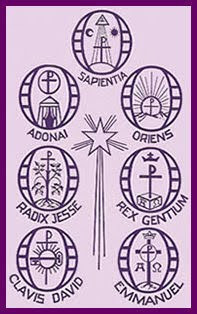 The "O Antiphons" begin today, so now is a good time to consider what exactly they are and how they can enrich the Advent season. An antiphon is a short verse from a psalm or other usually biblical source that is chanted (or at least recited) before and/or after a psalm. The O Antiphons are the antiphons chanted on each of the seven days before Christmas Eve, Dec. 17-23. On each day, a different O Antiphon is sung during Evening Prayer, which is the portion of the Liturgy of the Hours that is prayed at sunset. They are called “O” antiphons because each one starts with the exclamation “O”, followed by a title of the Savior. They are meant to heighten our awareness of the coming of the Lord as we approach those precious few days before Christmas. Besides praying these during the Liturgy of the Hours, families can also make up their own prayer services using the O Antiphons. For example, everyone could recite the Antiphon for the day together, then the father could read the appropriate passage from Isaiah, and then end with everyone singing “O Come, O Come Emmanuel.” During Advent, it is always good to set aside some time to pray as a family. Fr. Z: The O Antiphons, and O! Between now and Christmas, I will be posting a YouTube video for each day's antiphon, so that you can hear a bit of how they are chanted. They are really quite beautiful! 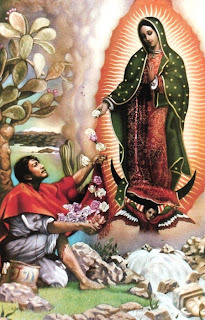 This prayer, dedicated to Mary Immaculate, was composed by Pope Pius XII for the Marian Year (December 8, 1953-December 8, 1954), which was proclaimed to mark the centenary of the definition of the dogma of the Immaculate Conception. Enraptured by the splendor of your heavenly beauty, and impelled by the anxieties of the world, we cast ourselves into your arms, 0 Immacuate Mother of Jesus and our Mother, Mary, confident of finding in your most loving heart appeasement of our ardent desires, and a safe harbor from the tempests which beset us on every side. Though degraded by our faults and overwhelmed by infinite misery, we admire and praise the peerless richness of sublime gifts with which God has filled you, above every other mere creature, from the first moment of your conception until the day on which, after your assumption into heaven, He crowned you Queen of the Universe. O crystal fountain of faith, bathe our minds with the eternal truths! O fragrant Lily of all holiness, captivate our hearts with your heavenly perfume! 0 Conqueress of evil and death, inspire in us a deep horror of sin, which makes the soul detestable to God and a slave of hell! O well-beloved of God, hear the ardent cry which rises up from every heart. Bend tenderly over our aching wounds. Convert the wicked, dry the tears of the afflicted and oppressed, comfort the poor and humble, quench hatreds, sweeten harshness, safeguard the flower of purity in youth, protect the holy Church, make all men feel the attraction of Christian goodness. In your name, resounding harmoniously in heaven, may they recognize that they are brothers, and that the nations are members of one family, upon which may there shine forth the sun of a universal and sincere peace. Receive, O most sweet Mother, our humble supplications, and above all obtain for us that, one day, happy with you, we may repeat before your throne that hymn which today is sung on earth around your altars: You are all-beautiful, O Mary! You are the glory, you are the joy, you are the honor of our people! Amen. It his Apostolic Constitution Ineffabilis Deus, Pope Pius IX declared as a dogma the belief that "the most Blessed Virgin Mary, in the first instance of her conception, by a singular grace and privilege granted by Almighty God, in view of the merits of Jesus Christ, the Savior of the human race, was preserved free from all stain of original sin." This is the Immaculate Conception. What Is It and Why Do People Have Problems with It? What Does Paul Mean By "All"? So Mary Needed No Savior? What about the Eastern Orthodox Churches? Why Her and Not Us? How Do We Respond to Romans 3? If Mary Was Sinless, Why Did She Go to the Temple for Purification? 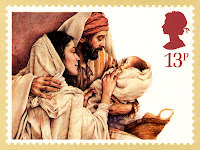 If Mary Was Sinless, Why Didn't She Redeem Us? Was Mary's Immaculate Conception Absolutely Necessary? For my own defense of Mary's Immaculate Conception, see Mary's Sinlessness: Part 1 and Part 2. This year the Optional Memorial of St. Nicholas is superseded by the Second Sunday of Advent, but I think it's well and good to continue the tradition of honoring this saint in one's home. Unfortunately, there's a lot of myth mixed in with fact regarding the story of his life, so here's some resources on St. Nick and how he came to be associated with the jolly fat man in the red suit. Also, ever wonder why you always find candy in your shoes on this day? That will be answered here too. Santa Claus vs. St. Nicholas? Here are some resources for Advent to increase your knowledge of and appreciation for this liturgical season in the life of the Church. It's the Catholic New Year! Let us wait with eager anticipation for the coming of the Savior. If several articles came from the same source, I grouped them together. 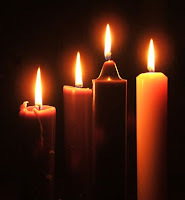 I will be updating this post throughout Advent, so check back often!. Are Peace and Advent Incompatible? Will We Choose to Lift the Cloud for Christmas? Advent: Don't Rush! It's Not Christmas Yet! Advent's Coming, Keep It Simple! O Come, O Come Liturgical Blue! 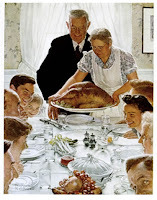 Here are some articles to help you appreciate this holiday and the virtue of thanksgiving that, as Christians, we are all called to embrace. I hope you all have a joyful and relaxing day! Sense of the Words "Kingdom of God"
Is Jesus Your King? Are You Sure? "What Is the Kingdom of God and How Can I Join?" 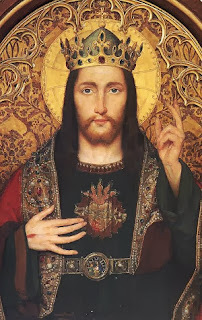 ALL HAIL CHRIST THE KING!